Built in 1966, by the Albina Machine and Engine Works of Portland, Oregon (hull #384) as the Diane Foss for Foss Launch and Tug Company of Tacoma, Washington. 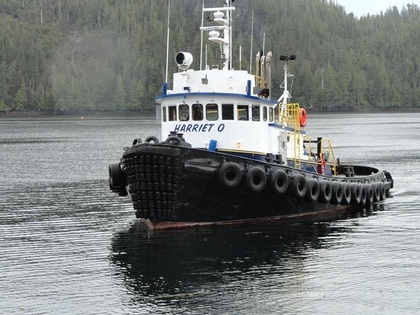 In 2009, the tug was acquired by Olson Marine Incorporated of Ketchikan, Alaska. Where she was renamed as the Harriet O.
Powered by two, Caterpillar diesel engines. Turning two, stainless steel 72(in) diameter by 50(in), by 54(in) fixed pitch propellers. She is a twin screw tug, rated at 1,300 horsepower. The tug's capacities are 20,000 gallons of fuel, and 1,500 gallons of potable water. Her towing gear consists of a Foss winch mounted on her bow. And a Markey, Tandem towing winch. Outfitted with 1600(ft) 1 3/8(in) towing wire.